It’s been a slow week on the blog for me. I’m still reading, but haven’t done much writing the last week or two. Working, volunteering, running errands, cooking, cleaning, clearing snow, clearing more snow, falling asleep in front of the TV – my brain gets foggy in the winter and I am desperately craving warmth and sunshine! A few new books showed up last week and fortunately my mailbox didn’t get knocked down during last weekend’s blizzard, so all arrived safe and sound. The World Before Us by Aislinn Hunter from Hogarth. A hauntingly poignant novel about madness, loss, and the ties that bind our past to our present. The Rebellion of Miss Lucy Ann Lobdell by William Klaber from St. Martin’s Press. The riveting true story of Lucy Lobdell, who, in 1855, left her home and family, cut her hair, changed clothes, and went off to live her life as a man. By the time it was over, she was notorious. Better Than Before: Mastering the Habits of Our Everyday Lives by Gretchen Rubin from Crown Books. If habits are a key to change, then what we really need to know is: How do we change our habits? Better than Before answers that question. It presents a practical, concrete framework to allow readers to understand their habits—and to change them for good. The Tusk That Did the Damage by Tania James from Knopf and TLC Tours. A tour de force set in South India that plumbs the moral complexities of the ivory trade through the eyes of a poacher, a documentary filmmaker, and, in a feat of audacious imagination, an infamous elephant known as the Gravedigger. The World Before Us is gorgeous! Usually these novels that take so long to come into the world are an amazing read. I’m adding this one to my list! The premise is very intriguing as well. 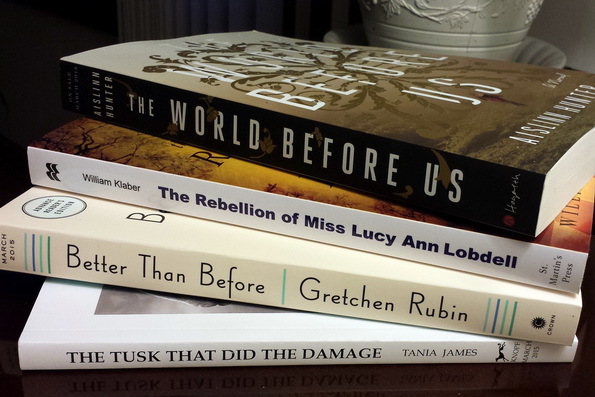 Better than Before and The Rebellion of Miss Lucy Ann Lobdell look really enjoyable. I’m going to watch for their release here. I want The Tusk that Dis the Damage:( enjoy all. The World Before Us looks like a good one. Happy reading, and I hope the snow lets up for everyone in the north soon! I read Lucy Ann Lobdell last week. It was good! I like your photo. It looks like you received some great books. I’ve seen The Tusk That Did The Damage on another blog today. I hope you enjoy all of your new books and stay warm! Sorry about all the snow and the cold – I wish you could come down here. Enjoy your great looking new books. These all look so good…and The World Before Us is going on my list. Enjoy! And good news that the mailbox is still standing. Yeah, we’ve been doing a lot of shoveling here too. This is the second time I see The World Before Us and I would love to read it. Hope you enjoy all your new books. I received The World Before Us too. I hope we like it. Lots of good books there. I like The Rebellion of Miss Lucy Ann Lobdell…it sounds quite good. Gorgeous books. We haven’t had snow since Christmas. It’s been in the 50s here. So unheard of. Enjoy your books! I also received The Tusk That Did the Damage. Enjoy your books, Leslie! I haven’t been able to have as much time with book lately.